RGCD readers who are familiar with the XBOX indie scene will realise that a purchase can be a bit of a gamble. Polished gems sit innocuously beside poisonous 'games' that do naught but make the controller vibrate. (Ahem). If only we could up our real life luck' stats by equipping an enchanted ring, perhaps we'd stumble across games like Cursed Loot more often. 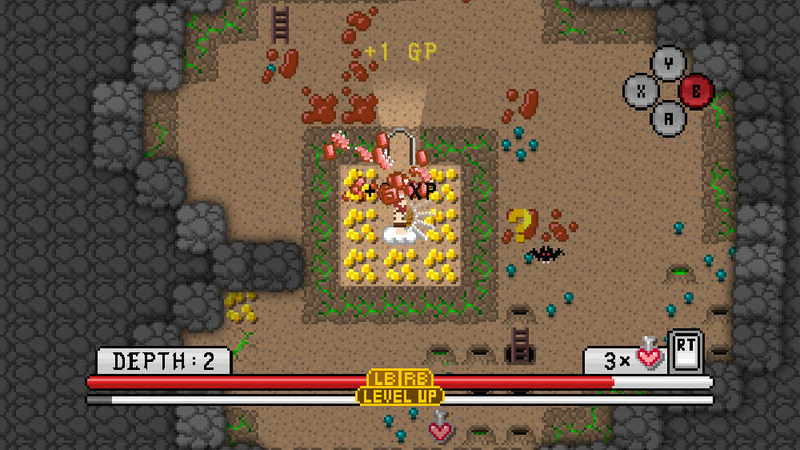 A polished and deliberately old-school roguelike, Cursed Loot has the player choosing between 5 classes of character and sending them off into a randomly generated dungeon 50 levels deep. Play is quick and vicious, with automatic attacking as you move. The speed of the game can mean the play can feel slightly more like Gauntlet than Rogue in places, especially when coupled with the NES-era style graphics. 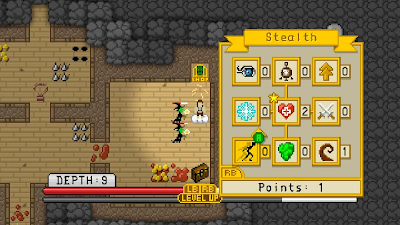 As you move around slaying bats, rats, witches, vampires and many other foes, you'll need to keep an eye on your Experience and Health meters which show your progression towards leveling-up and death respectively. Leveling-up awards points to be assigned to those RPG favourites 'Damage', 'Defense', 'Dexterity', and 'Luck'. These can also be modified by items worn/equipped (yep, it's the old D&D style +5 Damage sword), and these items themselves can become cursed or modified with potions and magic scrolls that litter the dungeon. Skills are upgraded every few levels – and each character class has its own primary skill that is upgraded quicker. These vary from regeneration of health to special attacks (assigned to the face buttons). From all this talk of class, skills, stats and levels, it should be clear that there is a lot of statistics and dice rolling going on under the bonnet of Cursed Loot, but it is presented in a fairly approachable way to the user – even those new to the roguelike systems. Beginners may die a lot, and wonder what they are doing wrong, but hints, help and three difficult modes go some way to rectifying this. One thing that will surprise the newcomer is that your death is permanent – a design choice that feels delicious harsh, especially in the namby pamby 21st century where the option to continue seems ubiquitous. Not so here! Expect to hurl the controller through the television after battling down to the depths of the dungeon, only to be slain because you were not quick enough to the right-trigger (which is conveniently always assigned to 'Drink Health Potion'). As a nice, yet slightly gruesome addition, your demise will be marked by a gravestone somewhere on that level should you get down there on a subsequent visit. 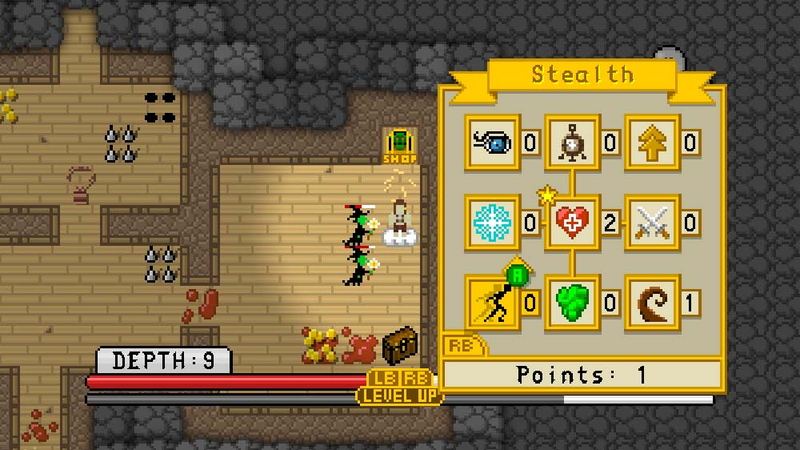 It is very clear that Eyehook Games have not just presented a barebones roguelike: this is a well balanced affair, and as well as the normal fighting there are encounters (which are small choose-your-own adventure text interludes that affect your game), shops (to spend your booty, stock up on Health Potions, and identify Magic Scrolls) and even a mini Canabalt-lite section when falling down tunnels between levels. To add even more sugary icing to the cake 'Awardments' are given for achieving specific in-game or meta-game goals (behaving akin to XBOX Achievements, but Microsoft do not support Achievements within indie games). At only 80 MS points (65p or so, depending on exchange rate you bought your points at) Cursed Loot represents great value for those who are prepared for the old school nature of the game (which admittedly will not be everyone). When you allow Cursed Loot to take hold though, it doesn't take long before you are thinking about selling your +5 sword to buy a +10 mace, using your magic ring and enchantment potion, whilst considering your upgrade options for your Perception skill vs your Orb skill. At this point you should just give in - just mute the (very pleasant and original) in-game music, put prog-rock on your hi-fi and admit it - you have become a nerd. Cursed Loot has claimed you, and a life involving polyhedral dice awaits. It should be noted that Cursed Dungeon is an update of 'Epic Dungeon' (now removed from the XBOX indie channel) and some people have been quite vocal about feeling that as an update it should have been free rather than costing another 80 points. This complaint is a little churlish in an era when paid for DLC is regularly released with far less content than this. (E.g. weapon skins for Gears Of War 3 are three times the price of this whole game). Even if it were priced at 160 points Cursed Loot would still come highly recommended. The trial and full versions of Cursed Loot can be downloaded/bought here (from the XBOX Games Marketplace). Would you please take a moment to introduce yourself to our readers who may not be familiar with your name. Hi, I'm Mike Muir, the founder of Eyehook Games LLC. Eyehook Games is a one man game development shop that currently develops exclusively for Xbox Indie Games. 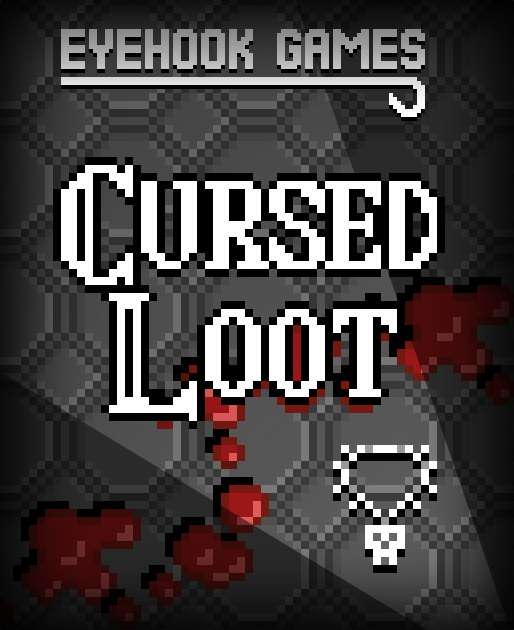 Cursed Loot obviously takes its inspiration from Dungeon Crawler/Roguelikes and its art style from the 8-bit era. Are these things you have particularly fond memories/affinity for? Absolutely. While not a roguelike, Adventure on the Atari 2600 was one of the first video games I played, and I was obsessed with it. 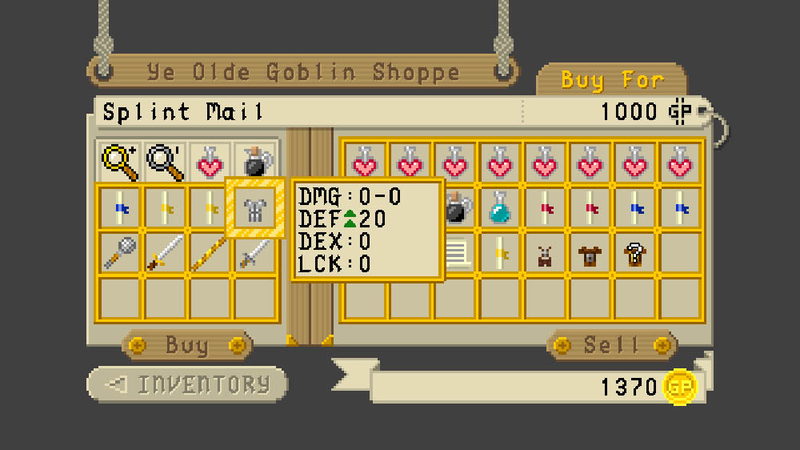 To be honest, I didn't play classic roguelikes heavily, but I love their random nature and punishing difficulty. Instead, I wasted most of my time playing MUDs back in the day. Is this your first game? Hmmm, is it really? It's flippin' good for a debut title! Explain yourself! I, personally, wrote a few games before Cursed Loot. But, nothing nearing its scale. Mostly, I just wrote small web-based games as a hobby. 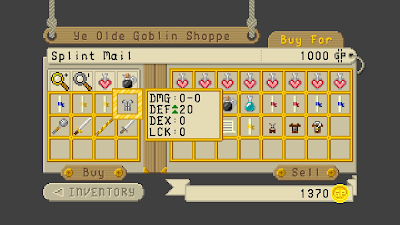 In fact, one of my first games was a small roguelike as well. I do come from a professional programming background, and XNA (which is the foundation for Xbox Indie Games) is great. XNA made console development much more accessible than I had expected. That's pretty interesting. Since I don't have any real 8-Bit development experience, it's hard to say. I suspect it would be possible, but quite a challenge. Maybe a challenge I'm not quite up for... yet. As a one-man developer, do you find that you need to wear different hats as designer, artist, programmer, composer and play-tester? How does this influence the creative process? Have you considered collaborative game making - or are you a resolute loner? I tend to have a short attention span, so having to juggle a lot of roles is actually good. If I get bored with programming I can work on art assets, if I get bored with that, I can work on music. The only real difficulty is switching between development mode and marketing mode. Marketing is a real challenge and is a lot more time consuming than one would think. I definitely have considered working collaboratively, and may very well in the future. But, currently, game development is still largely a hobby for me so working on my own schedule suits me well. 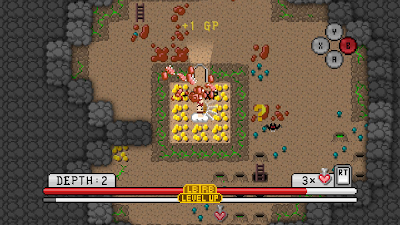 Is it socially acceptable to enjoy Roguelike games in 2011? Ditto tabletop D&D games? If anything, I think there a bit of a roguelike renaissance going on, and to a larger extent retro-gaming in general. It's nostalgia for us first generation gamers, and I think the next generation is finally discovering what we knew all along. Great gameplay doesn't need next-gen HD graphics. I haven't played D&D for quite some time now — I spent more time poring over the books and maps and pictures than actually playing it, so I can't really say. But, obviously, there are some huge and amazing tabletop conventions these days, so I can only suspect that it's a great time to play. Which C.L. character class are you most like in real life/prefer? Has the success of Cursed Loot meant fame and riches? Will you be sticking with the XBLIG model or moving to other platforms? Rule #1 of XBLIG development is that you are going to spend way more time and money than you'll ever get back (there are of course a few notable exceptions, but they are VERY few). Other platforms seem to be much more lucrative, but XBLIG is a great place for the hobbyist. I enjoy XNA and the community and that's enough for me right now. 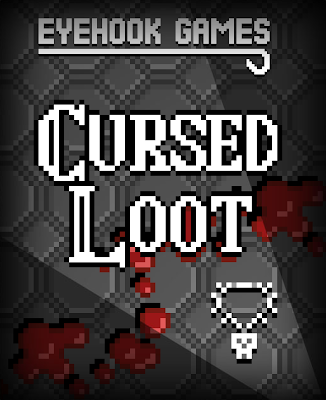 There have been a lot of requests to release Cursed Loot on PC and I might look into that down the road, but for now I'm happy with just plugging along on XBLIG. Can you recommend any other Xbox indie games that RGCD readers might enjoy? Soulcaster I & II are fantastic. I can't recommend them highly enough. What projects have you got upcoming? Can you reveal what you are working on next (Azure Void)? Will that also be an XBLIG release? Azure Void is my next 'big' project and it's turning out to be a lot 'bigger' than anticipated. But, it is currently slated for XBLIG sometime in the next decade or so. I might do a few smaller projects in the meantime, but no definite plans yet. I just want to thank you for giving me the opportunity to talk about Cursed Loot and I hope everybody enjoys it as much as I enjoyed making it!